When you are looking to buy diamonds, it is important to understand how the diamond price is calculated. While we can’t set the budget for your purchase, we can outline the most important criteria that affect the diamond price. In this guide, you will learn they how the prices are calculated, what influences them and the price evolution of the most valuable types of diamonds. This guide will take 15 minutes to read. By the end, you will have all the knowledge you need to understand what determines the diamond price and how you can use the information to save up to 70% on your budget. If you are in a hurry, you can skip down to the end of the page to read our recommendations and find our top tips to save on your next purchase. Diamond cost is calculated per carat. The price per carat increases as the carat weight goes up. This is because larger stones are less common than smaller ones. The increase is exponential as the higher in carat size we go, the rarer the diamond becomes. If you are buying in any other currency take into account the relative strength of the dollar. More or less, the chart sets the standard in the industry and is used by merchants to determine the diamond price. While carat is the number one consideration as you’ve seen already, other characteristics may be decisive for the diamond price as well. Loose stones are all unique. There are dozens of permutations out there, and each one has at least some impact on the diamond price. Cut: this is the second of the four Cs – the criteria used to determine the quality of diamonds. As such, the cut will have an impact on the diamond price. The cut is determining for the manner in which a diamond will reflect light and thus – for its brilliance. A well-cut diamond tends to be much more desirable than a stone that isn’t characterized by a lot of sparkle. Diamonds come with a cut grade in the range from poor to excellent according to GIA. Stones that are classified either as very good or excellent regarding cut will be much more expensive than poor cut stones. Clarity: the third C also has an impact on the value of loose stones. Cloudiness, spots, and cracks are all imperfections that interfere with the clarity of a diamond. As such, they can quickly bring the diamond price down. Flaws are usually examined during an inspection that’s carried out before buying the stone. If any defects are noticed, these could easily become grounds for demanding a price reduction. Shape: there are many shapes out there to choose among – oval, princess, round, cushion and emerald are just a few of the options. Just like the other characteristics already mentioned, the shape can contribute to the brilliance of the stone and impact its price. Round ones tend to be the most popular variety with round one-carat diamonds making the bulk of purchases. The high demand has contributed to a higher cost for round stones. Also, a lot of raw material is removed to give the diamond such a shape, which means that the process is highly wasteful in comparison to how other forms come into existence. Color: this is a metric used to determine the whiteness and transparency of a stone. There will once again be a grade assigned to each stone, and this grade will have an impact on its valuation. A colorless stone is usually assigned a grade D by GIA, and it tends to be the most expensive one. A nearly colorless stone will have a grade in the range from G to J, and it will be the second most expensive option. Stones that have a light yellow tint receive a grade in the range from N to R, and yellow Stones are the least expensive ones that get assigned a grade from S to Z. Certification: some authorities refer to certification as the final C because it affects diamond desirability just like the other quality criteria. Having a stone certified by one of the internationally-recognized organizations will give certainty as to the quality of the stone. Where to buy: Jeweler or retail markup has the biggest effect on diamond pricing. The same diamond can have up to 100% markup when you buy from a jeweler or set in a ring. Avoid these high markups by buying the loose stone separately. It is updated every Friday and represents the current market value of diamonds. As you can see it is a grid that shows the price per carat for a given color and clarity of a stone. If you take a look at a standard Rapaport chart, you will see that the color, the clarity, and the carat will all be considered. In the chart, you’ll see the price of round, heart, pear and other types of stones. More or less, the chart sets the standard in the industry and is used by merchants to determine the price of all diamonds. Thus, based on this chart, a 0.86 carat stone can be valued anywhere between 1380 and 6977 dollars per carat. 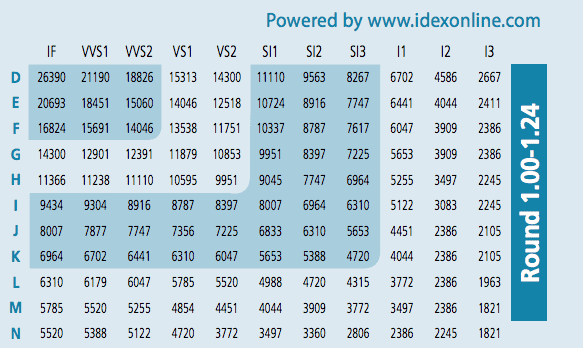 Next to the Rapaport price list there exist other indexes that are used to show the current market value of diamonds. One of those is published by IDEX and is called the Diamond Retail Benchmark. Like the Rap list, the DRB offers a high-level standard price off of which should be applied a “discount” to arrive at the final consumer price. The list is available here, but without knowing what “discount” should be applied in your specific case, it will be challenging to extract any usable information. The DRB presents a retail price recommendation for a diamond based on each of the 4Cs – Cut, Carat, Color and Clarity. The benchmark is based on the high-end of retail prices currently in the market place, therefore allowing enough room for all business models. The DRB should be used as background information only. Actual prices are determined by the sellers. Diamond price: How much does a diamond cost? The average diamond size being used for diamond engagement or wedding ring is one carat. So what is the value of a one-carat diamond? As we explained earlier many factors would influence the diamond price The chart from DRB we have shown earlier shows the price differences for a 1 carat round, excellent cut diamond. As you can see based on the color or clarity, there is a wide range of prices. These values are based on June 2018 data. Diamond price: One Carat Diamonds Price Evolution: How does it Fluctuate in Comparison to Other Diamonds? Historically, the diamond price has always changed. From 1960 to 2017, their value has grown by 14.47 percent. As the demand for luxury goods continues to grow and diamond mining remains a constant, analysts predict that the price of one-carat diamonds can be expected to increase by six percent annually in the period until 2020. At present, the annual increase has been set at approximately four percent. 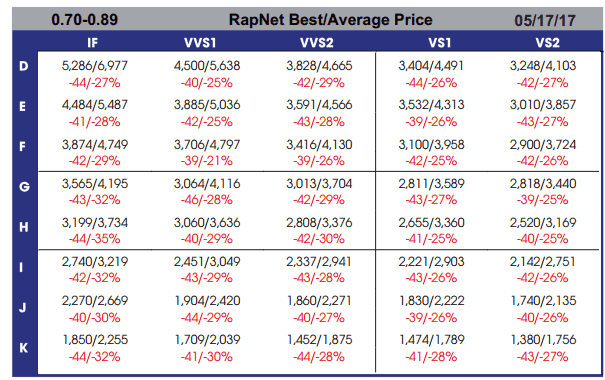 Keep in mind that while the Rapaport price chart does have a big impact on the valuation of diamonds, market forces are also at play. The stability of the economy can be used as an indicator of fluctuations in the price of a one-carat diamond – probably the stone that’s most in demand, thus a benchmark in the field. This isn’t the case for other gemstones, which is why serious fluctuations occur. It’s possible to find the same gem that’s massively overpriced due to the lack of benchmarks. While some merchants can definitely attempt to overprice diamonds, it’s much easier for customers to keep track of a price level that’s adequate for the respective moment. The history of diamonds suggests one more thing – the price of more commonly found stone is more stable. These are the 0.5, the one and the two-carat stones. Fluctuations are much more typical with larger diamonds because they are rarer. This is also the reason why the change in price is smaller for 1-carat diamonds than it is for two, three and even four-carat stones. The price of a four-carat diamond, for example, has tripled in the short period between 2004 and 2008. The value of a 1-carat diamond has not gone up so steeply during this period. Here’s one more example that can be used to demonstrate the claims about diamond price evolution: Over the first quarter of 2016, the price of one-carat diamonds experienced a zero percent fluctuation. In comparison, diamonds in the two to three carats range became one percent less expensive and diamonds in the 0 to 0.5-carat range gained two percent in price. These numbers are a clear illustration of the price stability that the most demanded stones experience. Diamond price: How do Loose Diamond Values Compare to Those of Diamond Jewellery? When it comes to buying diamonds, you have two options – loose diamonds or jewelry like diamond rings and earrings. For many people, loose diamonds are the option of preference because of the cost-efficiency that they bring to the table. The price of loose diamonds tends to be much more stable. They are calculated without a jeweler or another middleman to affect the process. Thus, the surplus charge isn’t as high. When jewelry is being made, craftsmanship and the value of precious metals have to be taken into consideration on top of the diamond. Going back to the earlier example, while a one-carat diamond can cost about 3,000 US dollars, a one-carat diamond engagement ring with a band made of 14K gold can start at about 5,000 dollars. There are exceptions, and it’s difficult to come up with an average, this figure speaks a lot. The more reputable a jewelry maker is, the more you’ll have to spend on a one-carat diamond engagement ring. In that instance, you’ll be paying for the craftsmanship and the characteristics that the brand stands for. All of these will be added on top of the base price you’ll have to pay for the one-carat diamond. One more thing to keep in mind is that loose diamonds will often be available at wholesale prices, especially if you’re looking to buy a bigger one. Thus, there could be additional possibilities to bring down the budget. If you’re looking for the best loose diamond buying opportunity, you may want to consider the following one. By filling out the form, you’ll give us a better idea of the important factors to consider when buying a stone. When you complete the form, you’ll be provided with a custom quote that will correspond to your preferences and give you our best offer. Based on this information, you probably have already reached the conclusion that diamond valuation isn’t an easy task. Carat measurements matter but so do many other features. Market forces are also at play, especially when it comes to rare diamonds that are in high demand. In contrast, the highly popular one-carat diamonds tend to benefit from much higher price stability. Whether you’re interested in loose diamonds as an investment or getting stones for the creation of custom jewelry, identifying the right price to quality ratio will be of paramount importance. Obviously, the task isn’t easy to accomplish because of the multiple criteria that may potentially balance out each other or contribute to a sharp increase in the price of the respective stone. Getting a good deal is all about being informed. Hopefully, the resources provided in this guide will make it much easier for you to identify stones on the market that are worth buying. Look for a stone just below 1 carat (or half carats) for a big reduction in price - up to 20%. Cut is the key to a brilliant stone. Color and clarity are the parameters you can use to optimize your budget. Buy your diamond loose and online to save up to 70% compared to traditional retailers. Round diamonds tend to be pricier than other shapes. Consider a fancy shape if you have a lower budget.